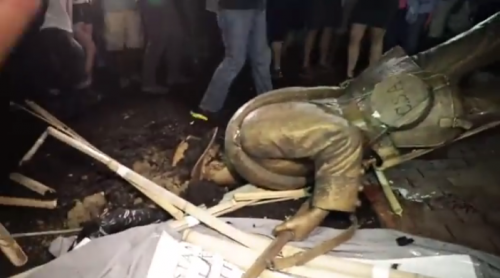 Silent Sam, the statue of a weary, stoic Confederate Army foot soldier, came crashing down Monday night, pulled down from his post at the edge of the UNC-Chapel Hill campus by a howling mob of protesters. But a lot more fell than a Progressive-era statue of a Confederate soldier. Another brick in the wall that separates civilization and barbarism was dislodged. Another small part of the social contract that calls on us to settle our differences through dialogue and consensus disappeared. Another thin thread in the rule of law was severed. Even those who feel that Silent Sam was a symbol of racism—as did the mob—should be concerned about his rough treatment. Whether you believe that Sam represented white supremacy, the dignity of the common soldier, or simply the historical record of the state and campus, he now represents the defense of civil society and rule of law. And his rude descent from his perch was an assault on that civility. It is up to the state’s leaders—the legislature, the governor, the Boards of Governors and Trustees, and the university and university system’s top administrators—to push back against the forces of anarchy. How they do so may say a lot about the future of the state—and their own. We have been in touch with UNC-Chapel Hill Trustee Chair Cochrane and Chancellor Folt both last night and this morning about the removal of the Silent Sam statue on UNC-CH’s campus. Campus leadership is in collaboration with campus police, who are pulling together a timeline of the events, reviewing video evidence, and conducting interviews that will inform a full criminal investigation. The safety and security of our students, faculty, and staff are paramount. And the actions last evening were unacceptable, dangerous, and incomprehensible. We are a nation of laws—and mob rule and the intentional destruction of public property will not be tolerated. There is no place for the destruction of property on our college campuses or in any North Carolina community; the perpetrators should be arrested and prosecuted by public safety officials to make clear that mob rule and acts of violence will not be tolerated in our state. But those are all words, spoken in the aftermath of a failure. Sometimes words have a hard time becoming actions. Of great concern is the possibility that UNC-Chapel Hill’s administration intentionally turned a blind eye to the violence. Certainly, they had motives to put an end to the Silent Sam’s presence on campus. He had become an albatross around their necks: estimates for protecting Sam last school year were upwards of $300,000; his continued presence was divisive; he was a source of bad publicity in the mainstream press and hurt the administration’s standing with the school’s radical elements. And the events of August 20th suggest that the campus police did not protect Sam to the fullest of their ability. It was well known that the possibility of vandalism to Sam that night was extremely high. Social media posts and flyers posted all along Franklin Street announced the protest for days—security should have been at a high point. During the previous school year, the statue had been surrounded with barricades, inside which police could stand watch. This year, the barricades have been absent. And pulling down the statue took some time and effort. Eyewitnesses said the police appeared to stand down and watch throughout the process, springing into action only after the fact to make a single arrest and prevent further damage. That suggests a mockery of the rule of law rather than enforcement. Since the Confederate Monument was brought down last night, many have questioned how police officers responded to protesters and how the University managed the event. Safety is always paramount, but at no time did the administration direct the officers to allow protesters to topple the monument. During the event, we rely on the experience and judgment of law enforcement to make decisions on the ground, keeping safety as the top priority. The joint statement looks a great deal like damage control. To be clear: the university failed to protect Sam, somehow. The reason in the statement seems to be that the police were responsible for all the decisions and that the protesters were too clever for them. That raises more questions than it answers. Can the statement be believed? Are the police conveniently taking the fall for higher-ups? Given the importance of this issue, and given the prior knowledge that a large protest was happening that night, why wasn’t Chancellor Folt in charge, or at least in constant contact? If the police used inadequate force, why, given the fact that a Silent Sam protest in 2017 drew roughly 800 people, did they use inadequate force? If the police presence was adequate but outsmarted, why were they outsmarted? Even an eight-year-old who likes to play army knows that, if you need to defend the fort, you don’t stray too far from the fort. It takes time to attach a rope to a statue and pull it down. Were the police so far from the statue that they didn’t know this was happening? Once it was ascertained that the mob meant violence, could not the police have acted to disperse it? Something is not right in this joint statement. Is this immediate response similar to how UNC responded during the sports scandal, when UNC denied, obfuscated, gaslighted, misdirected, and stonewalled for many years? The events of that scandal suggest that it’s best to maintain some healthy skepticism at any pronouncements about campus controversies coming out of Chapel Hill. Now that Sam has suffered his ignoble defeat and he no longer stands guard over Franklin Street, what is to be done? Optimally, he would be raised back upon his pedestal in defiance of the mob. For doing so would take some of the starch out of the mob. Without such a strong response, the rioters will be emboldened to seek new targets for their bloodlust. And not just statues or buildings named long ago for men who were of their own time. They will attack all that is conventional, original, or lofty: they will bend the curriculum to their will, stifle dissenting voices, and chase off faculty whose beliefs are insufficiently radical. Unless they are stopped now. But given the possible complicity of the UNC-Chapel Hill administration in the mob’s action, it seems improbable that any investigation that involves Chancellor Folt and the campus police will get to the heart of the matter. What parent wishes their sons and daughters to attend a school that encourages mob rule and radical ideas? What taxpayer wishes to fund more of the same? Identifying the rioters who actually tore down the statue should not be difficult. There are numerous videos of the demonstration floating around and many security cameras in the area. Many of the protesters do not hide their participation in the crime; rather, they celebrate it on social media. Even if there are arrests, history suggests that, once the passions and indignation have ebbed, punishments will be minor at best. Disturbing the peace charges for the seven protesters arrested at the 2009 Tancredo riot were dropped. Of the eight protesters arrested in the 2017 destruction of a statue at the Durham County Courthouse, one was found “not guilty” and the others had their charges dismissed. Nor are schools eager to punish student rioters. For the Tancredo riot, no students received lasting punishment. Maya Little, who was arrested for pouring a mixture of blood and paint on Silent Sam last spring, is still listed as a graduate student in the history department. There is some confusion over her trial dates; she has written that she had a criminal trial on August 20 (one reason why the protest was planned for that date), but she is on the Orange County courthouse docket for October 15. UNC-Chapel Hill stands at a crossroads. It has deep ties to the people of North Carolina—but the people will only stand for so much foolishness. They have no reason to support a school that holds them in contempt. The toppling of Silent Sam may help sever those ties. What parent wishes their sons and daughters to attend a school that encourages mob rule and radical ideas? What taxpayer wishes to fund more of the same? And given how the Folt administration has handled things so far, can she be part of the school’s future? There is, then, some danger of UNC becoming known for its radical ideas and inability to handle mob rule, which in turn can affect its overall reputation. 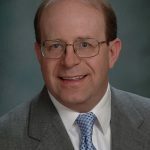 That has already happened to the University of Missouri, causing its applications, admissions standards, national ranking, and enrollment to drop. Or, by taking strong, swift actions to drive off its worst elements and to restore civility, it can become a national leader in the movements to maintain free inquiry and reform the academy.